Joran van der Sloot, center, is escorted by Peruvian police in Lima on June 5, 2010. 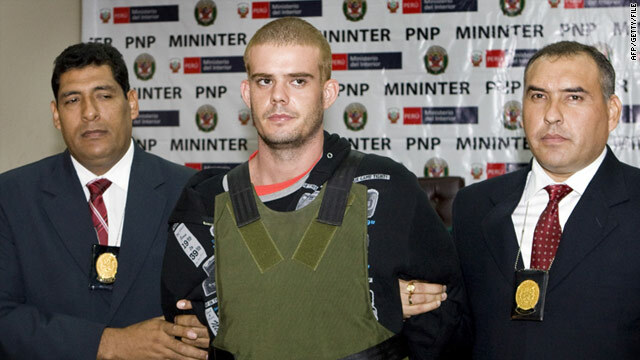 (CNN) -- Peruvian authorities have charged Joran van der Sloot with murder in the death of a Peruvian woman. Van der Sloot was arrested in June of last year, but was not formally charged until Thursday. Prosecutors are asking for a 30-year prison sentence and a restitution payment of $73,000 to the family of Stephany Flores. They also charged van der Sloot with theft. Charged alongside van der Sloot were three Peruvian drivers who allegedly helped him flee into Chile. Prosecutors want five-year prison sentences for them and fines of about $1,800. Flores was found dead in van der Sloot's Lima hotel room in May 2010. Police say van der Sloot took money and bank cards from her wallet and fled to Chile, where he was arrested a few days later. Earlier this month, Flores' family urged prosecutors to file charges, warning that van der Sloot could be released by December unless the case goes ahead. Under Peruvian law, if a suspect's trial doesn't begin within 18 months of his arrest, he is set free. Investigators delivered their case file to prosecutors in June for a decision on charges. No date has been set for trial. But the Lima-based court said Thursday, in a news release, that a hearing on the case has been scheduled for the morning of September 12. At the hearing, prosecutors will present the charges and van der Sloot's lawyers will be given the chance to respond. The defendant has received a notice to appear for the proceeding, to which journalists and TV cameras will be allowed access, the court said. Van der Sloot's attorney said that the defense was expecting the charges to be filed, given the high-profile nature of the case. "We think 30 years is too much for this crime since it was an isolated incident without any further acts of violence," Luis Jimenez Navarro said. "We have had cases in Peru under similar circumstances that have gotten less than 25 years." Van der Sloot was once the prime suspect in the disappearance of Alabama teenager Natalee Holloway, who vanished while on a graduation trip to the Caribbean island of Aruba. He was arrested twice but never charged in connection with Holloway's disappearance, which remains unsolved.